Stephanie Schorow has successfully captured the excitement and drama of firefighting in Boston... Boston on Fire is a must read for all who love Boston, its history, and its renowned firefighting force. I did a video and wrote an article for the NFPA Journal on Boston's fire trail. Stephanie discusses the "Great Fires of Boston" with local historian John Horrigan. Historian and friend John Horrigan interviews me about Boston's most significant fires. Casey Grant discusses the legacy of the Cocoanut Grove fire as part of Boston Fire History week. 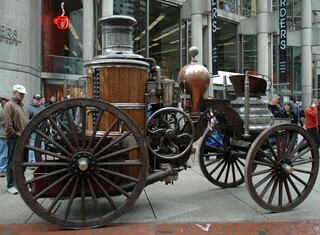 As part of Boston's first Fire History Month in 2009, the fire engine that saved Old South Meeting House during the Great Boston Fire of 1872 returned on the anniversary of the fire to almost the exact spot where it once made a last stand. On Nov. 9, 2010, members of the Boston Fire Historical Society brought back the Kearsarge, now undergoing restoration by Andy Swift of Hope, Maine. It was incredible how many people stopped to relate to this old technology -- dozens of IPhones were clicking all day, capturing the old steam engine in photos and video. The Kearsarge is not yet fully restored. Someday Andy hopes to have the old machine fully functional, which means that it will burn coal or wood to build up pressure. Water hooked to an external source-- i.e. a hydrant -- would then be sprayed out of attached hoses. This technology, awkward as it may seem today, was responsible for saving many cities and towns from burning in the 19th century. Previously, such "masheens" as they were called, were pumped by hand. We hope to bring back the fully restored Kearsarge to Downtown Boston in two years. If any groups are interested in co-sponsoring such an event, please contact Stephanie. For a slide show on the Kearsarge of photos taken by Stephanie, please click the caption under the photo.